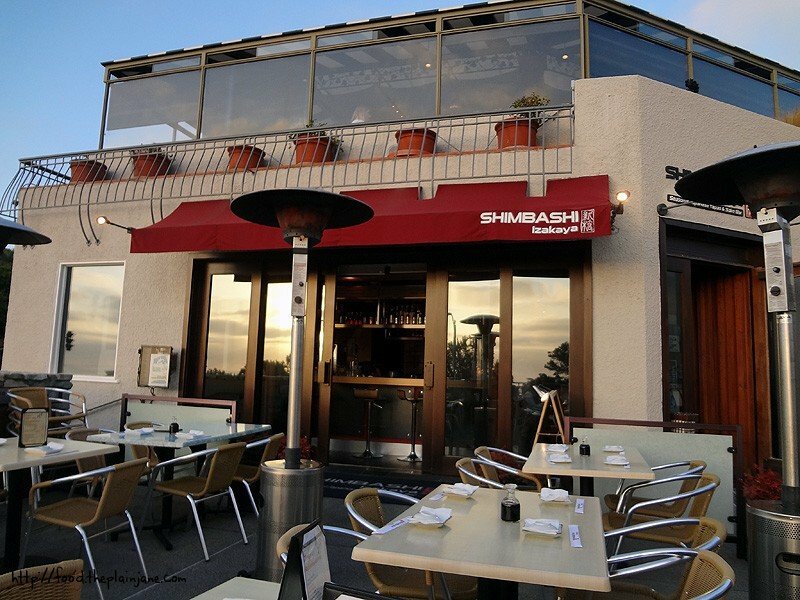 Shimbashi Izakaya is a Japanese restaurant located in the heart of downtown Del Mar, CA. 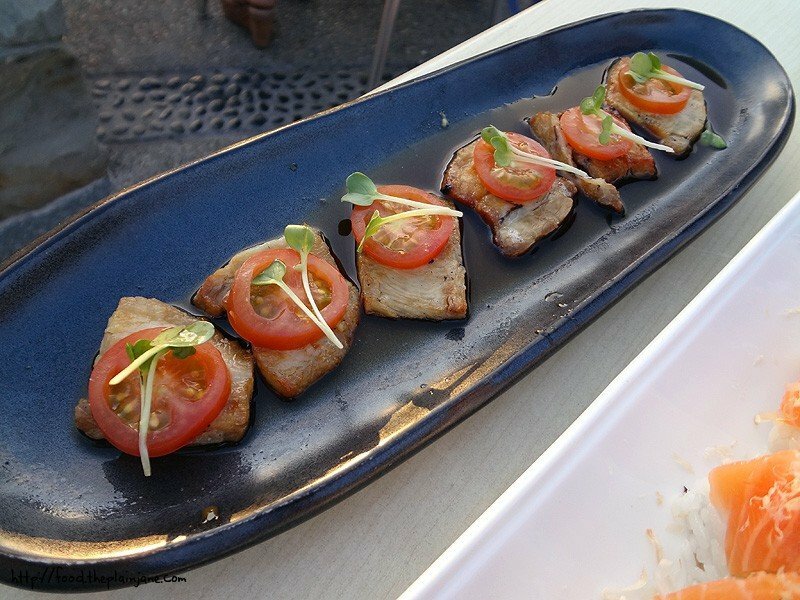 They serve a variety of “tapas” style menu items as well as sushi, noodles, and other Japanese dishes and seafood. I recently had the opportunity to try Shimbashi Izakaya for myself and was happily treated to a wonderful line up of delicious Japanese foods. Shimbashi Izakaya is in such a pretty spot with a nice outdoor patio. 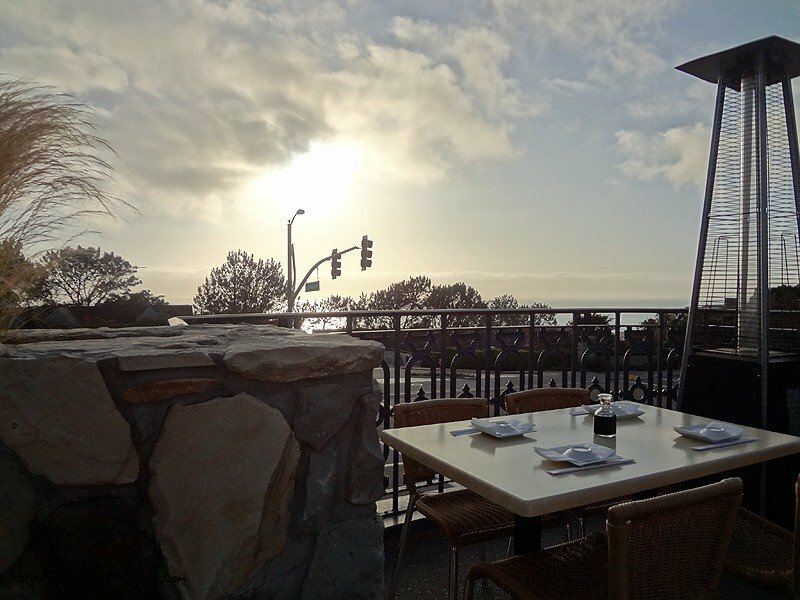 There’s an ocean view and if you’re lucky (ie: not dining in May or June), you’ll be treated to a sunny, ocean view. Our sunset was a little cloudy that evening and it was a bit chilly by the coast, but Laura and I were not deterred in the slightest! Also: heat lamps are a wonderful invention. 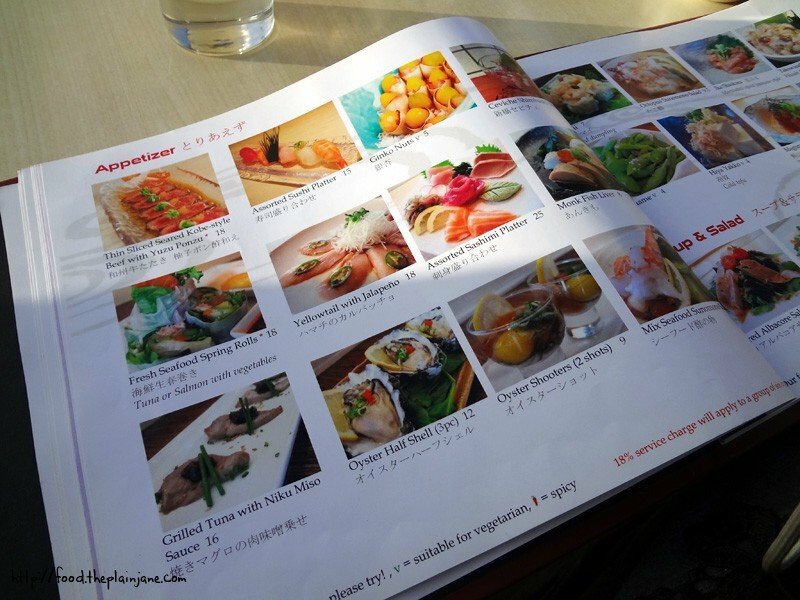 This is their menu – it looks like a picture book! I loved this idea, especially for cuisine that I’m not very familiar with. It’s so helpful to see photos of the items you want to order. Our hostess pretty much convinced me to try this drink. I wasn’t going to have any alcohol, but with a little pushing and prodding you can get me to try a lot of things. I admit, it didn’t really take much prodding. But, she did have them split our 1 Lychee martini into two glasses. This was very sweet – and I detected no alcohol, which is a crazy combination. 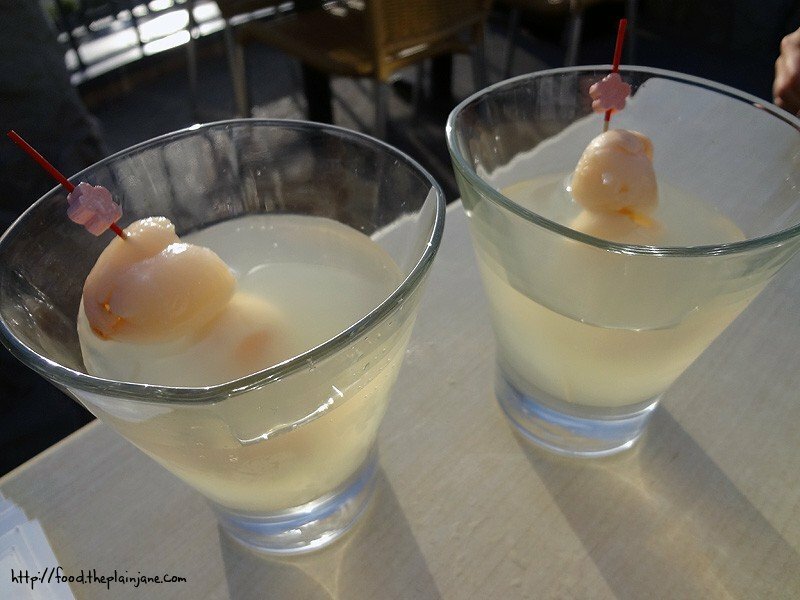 The flavor of the lychee comes shining through on this martini. While I thought the drink was good, it would have been better if it was a little less sweet. I loved the wooden skewers with the wooden flower bead – so cute! After perusing through their large menu, Laura and I decided to get a few appetizers to start. One was this: the Baked Mussels. 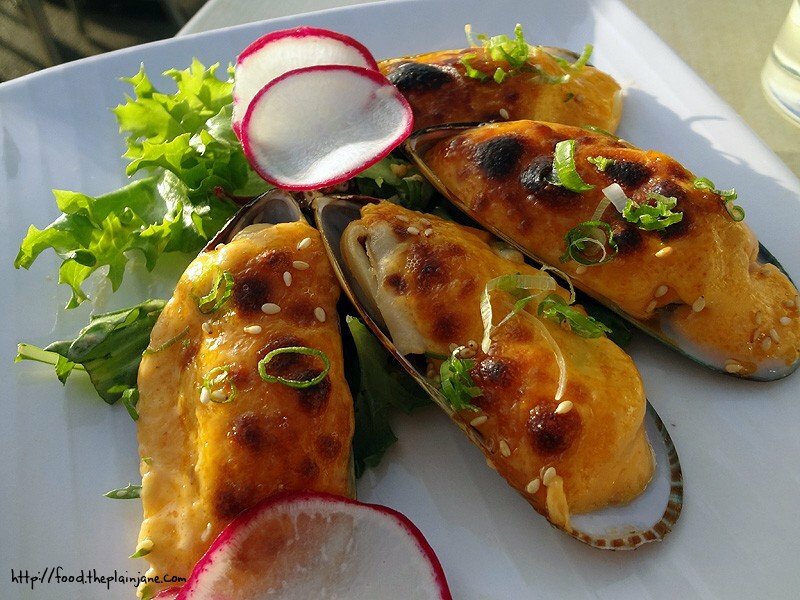 The mussels come back in their shells, grilled and topped with cheese and onions. Almost like a mini baked casserole in a shell. I liked the flavors of the mussels but I wasn’t too crazy about the type of cheese paired with it. It wasn’t bad, but I didn’t think the flavor of the mussel went that great with the cheese. I first saw this on Leanne’s post about Shimbashi and I already knew I would order it. Gigantic shrimp? In a honey glaze? FRIED?! Well damn, sign me up! 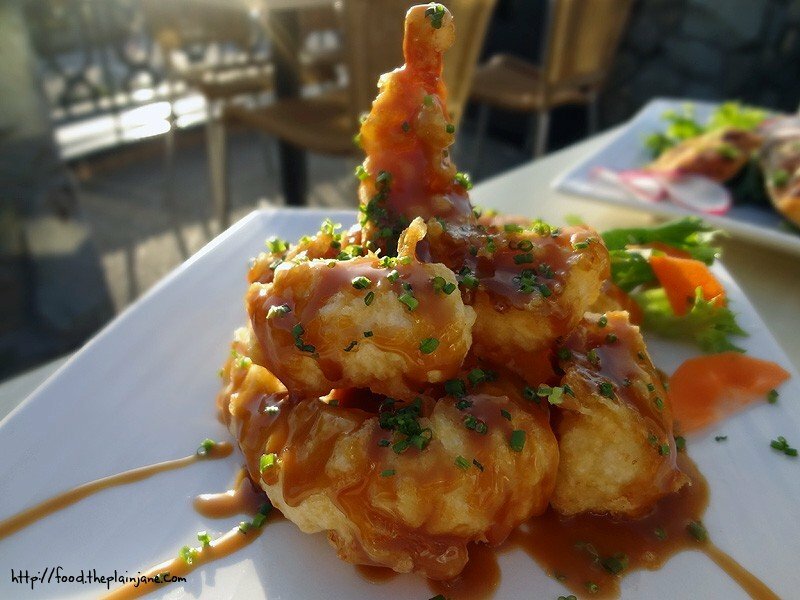 The presentation of this dish is just beautiful with the honey glaze artfully prepped over the dish and shrimp. This is definitely one of those dishes that tastes just as good as it looks. Perfect amount of batter to jumbo shrimp. Perfectly crisp and fried. And the sweet honey glaze sauce gives it an added sweetness that compliments the dish very well. I would happy eating this for the rest of my life. Next up – the Grilled Pork Belly. I see “pork belly” and my mind wanders into delicious realms. 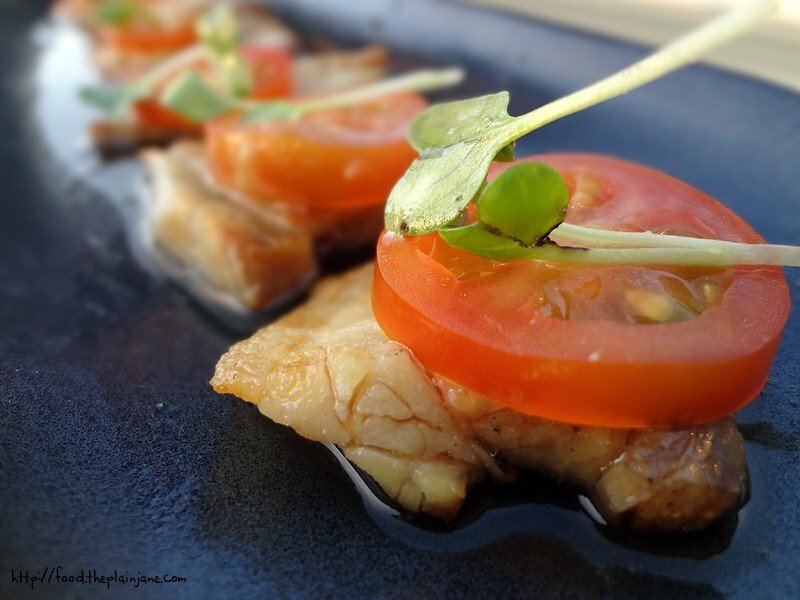 This is a simple preparation of the pork belly. It wasn’t quite what I was expecting either. It was definitely salty, but not overbearingly so. The pieces were a little tough and not quite the melt-in-your-mouth glory I was hoping for. They were little chewy pieces of pork that were not as interesting as I was hoping they would be. At this point we had made our decisions on rolls and final items for dinner and our hostess came out and made a few more suggestions for us. One was this Chilean Sea Bass which was the surprise hit of the night. 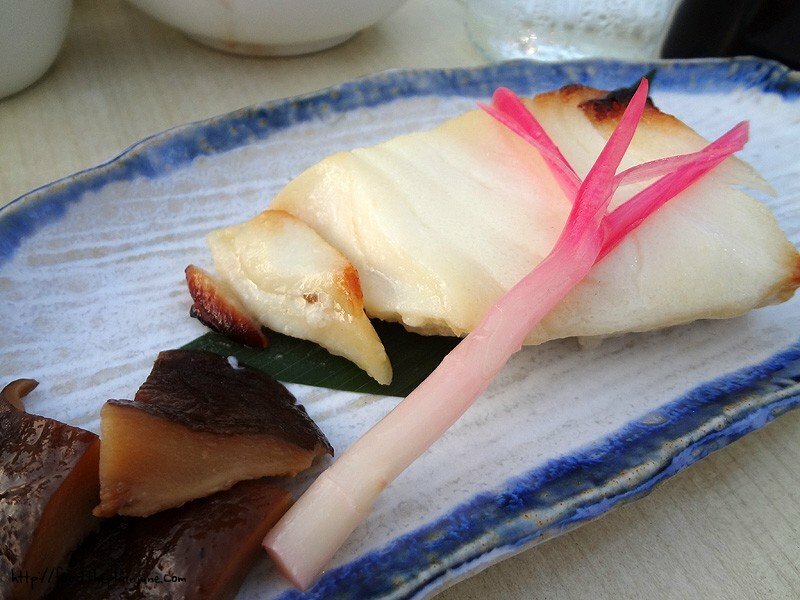 The Chilean Sea Bass is marinated in a Saikyo miso paste which comes from Kyoto in Japan. This results in a very sweet and very delicious flavor on the sea bass. It was so tender with a slight sweetness to it that Laura and I just could not stop eating it! It really doesn’t look like much, but the flavors here are smooth, sweet, moist and delicious. It flaked apart very easily and I was so surprised by its sweetness from the Saikyo miso paste. I’d have it again in a heartbeat. I am totally one of those “OHGODITSRAWFISH” people. I kind of shy away from it. 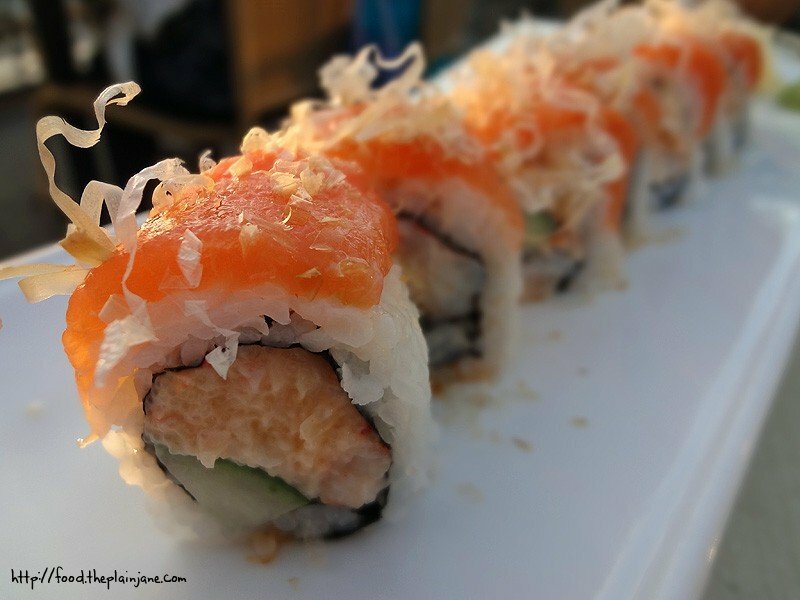 But I figured now was the time to be adventurous and on the recommendation of our lovely hostess, we tried the Lobster Salmon Roll. I’m not sushi expert and I won’t lie and say I have much experience with it (since I just outted myself anyway). I didn’t take to this one that well – I thought it was just okay – but then again, I’m not a super big fan of either lobster or salmon. I’d much rather just be off eating shrimp and clams and crab, thank you very much. It wasn’t terrible. But I just didn’t enjoy the overall flavor of this one. I ordered a non-fishy sushi roll since it sounded terribly interesting to me. 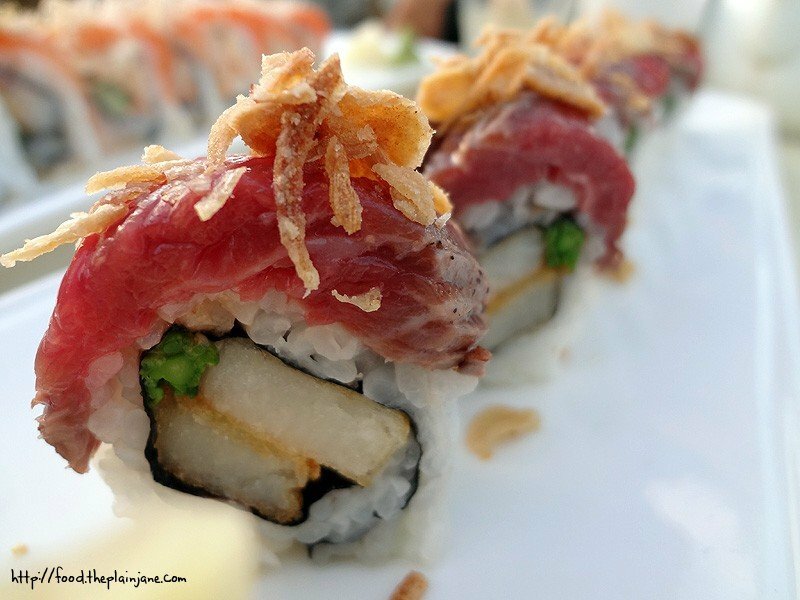 This roll comes with garlic salted potatoes, asparagus, spicy mayo and is topped with seared ribeye, sesame seeds, fried onions and garlic oil. I love the colors on this roll! The pink from the meat with that little dab of green from the asparagus looks so pretty. The meat is just barely seared and fairly raw. The potatoes are akin to french fries here. The whole thing tastes like an American dinner rolled into one bite. The crunch of the onions on top gives it a bit of saltiness and crunch. 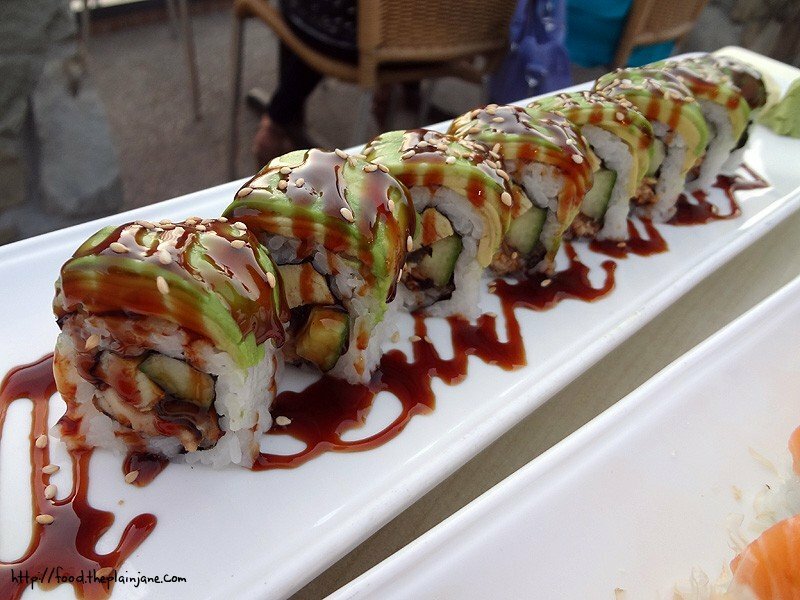 One of Laura’s favorite sushi’s involves eel. I hadn’t tried eel before either. She went with the Caterpillar Roll – eel, cucumer, tamago and topped with avocado, eel sauce and sesame seeds. I ended up liking this one a lot. I don’t know if it was the avocado, or the sauce, or the eel that was my favorite part but I thought the combination of flavors together just made it a very tasty bite. My super secret (not really) blogger mission is always try dessert. The most interesting looking item on the dessert menu was the Pear Pie, which we paired with a Lychee sorbet. We were assured the sorbet was not as sweet as the martini, so we gave it a shot. 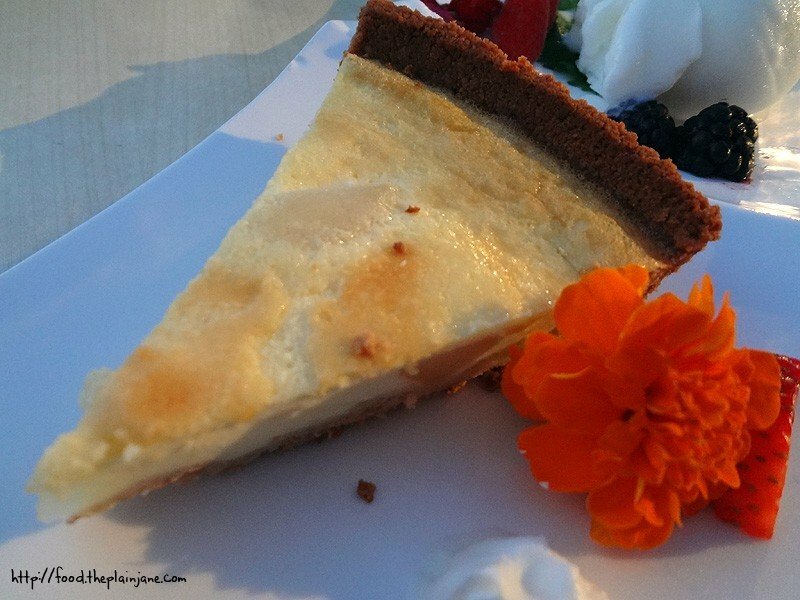 The Pear Pie is more like a custard pie with pear pieces in it. Laura didn’t think that the pear was very pronounced. I have to agree with her on that one. The pear flavor is pretty subtle, but I still enjoyed it overall. I liked the sweet custard with the pie but I wasn’t totally in love with it. 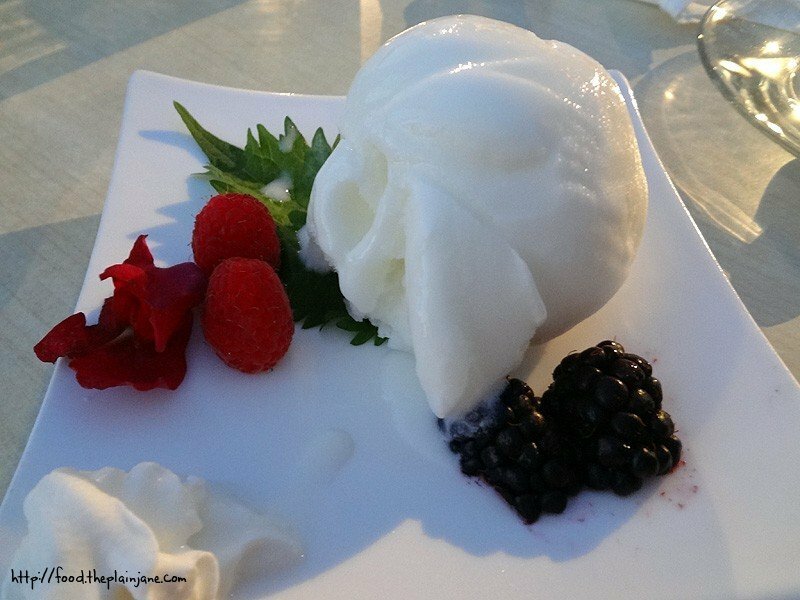 We both preferred the lychee sorbet – it was light and very refreshing with pieces of fresh lychee throughout the sorbet. It was a nice, delicate flavor and not too sweet at all. A very nice way to end a delicious meal. While I might not have loved everything I had here, I did enjoy the experience and most of our dishes. The tapas plates are easy to share with others and it’s a great way to try a bunch of different items together. The scenery and ocean views are also a big plus making it a nice spot for a special occasion or to bring out of town guests to. I’ve been wondering about this place for years – sounds like I better finally check it out, if for no other reason than those honey shrimp! I’m also on a mission to always try dessert when we’re out. I firmly believe in the separate-dessert-stomach theory and that there’s always room for sweets. I love seeing what other people have tried. Now after seeing this, I’m kicking myself for not having dessert OR the lychee drink. I went to shimbashi a year or two ago, and it was so good. Just haven’t had a chance to get back. You may have inspired me to! Hi Kathy – Oh yes. The honey shrimp is like the bestest thing ever! So tasty. Hi Darlene – I love seeing what other people got, too! It’s fun to see what other people choose when going to the same place (and what items you have in common). 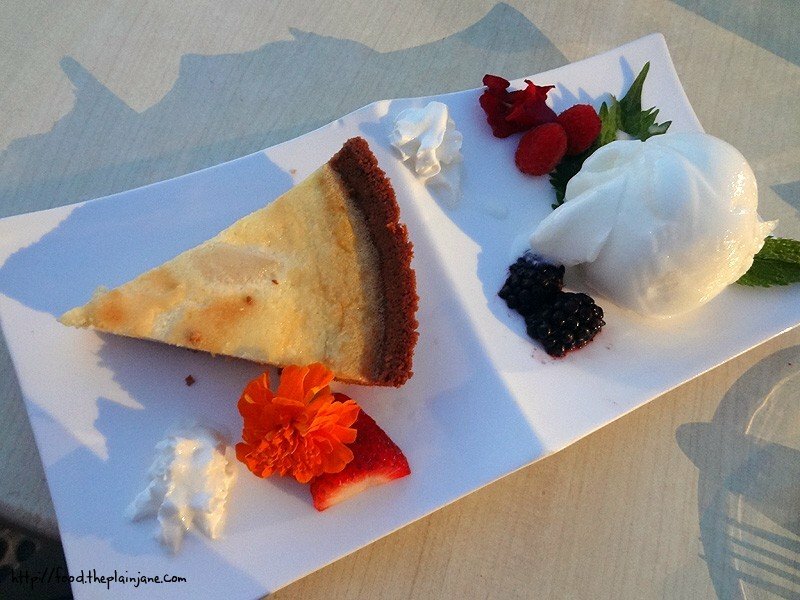 Hi Mary Lynne – Excellent food with a very pretty location! Hope you get a chance to revisit!